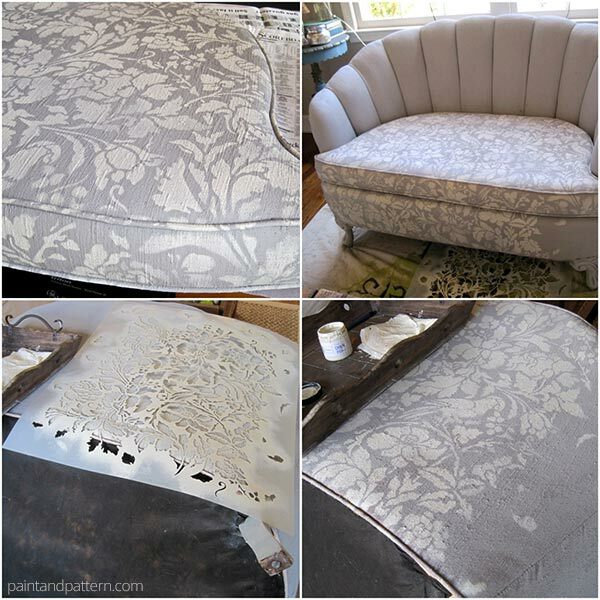 What do a French Floral Damask stencil, Chalk Paint® by Annie Sloan and an old raw silk loveseat have in common? Well not much individually, but together they can create an all new look in a day! Look what I created with the French Floral Damask Stencil, half a quart of Paris Grey Chalk Paint® by Annie Sloan and a sample pot of Old White! It’s a Chalk Paint Upholstery Upcycle miracle!! 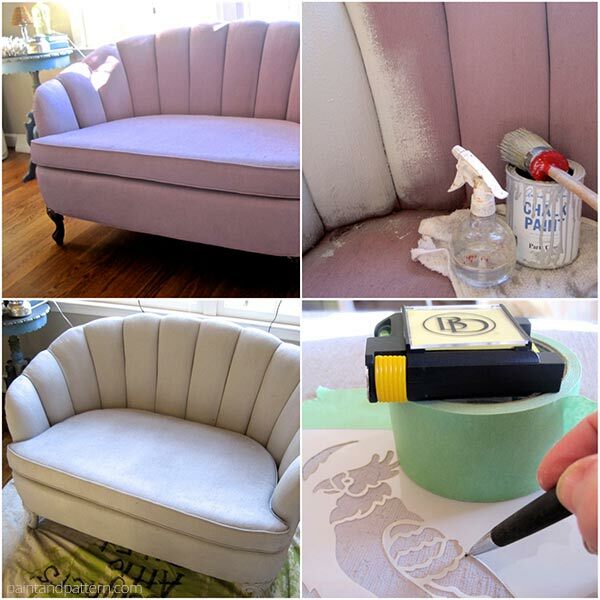 Were you aware that Chalk Paint® by Annie Sloan can be used to paint upholstery? Did you know that you can also use it to stencil? If you’ve been reading up on this exciting news, terrific. If you are shaking your head in disbelief, stay tuned and I will share all. First things first before I divulge all of the details so you can try this. 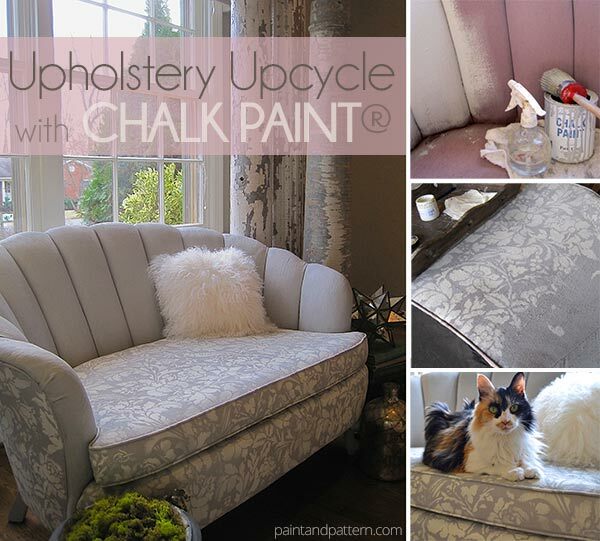 Chalk Paint® upholstery painting is a very satisfying project, and something that anyone can do easily. Re-painting the sofa with Chalk Paint here was a breeze, but stenciling it WAS a bit tricky, especially because it was over a padded and piped cushion. Also because tape doesn’t stick well on rough fabric…. So that said, if you love this idea, I recommend you start out with a partner or a small item and go for it! 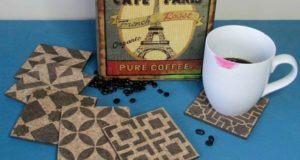 If you have never stenciled before, I would check out some of the simple but simply gorgeous stencil project how-to’s here on Paint+Pattern first! Your choice of Chalk Paint® colors, one for the loveseat and another for stenciling. 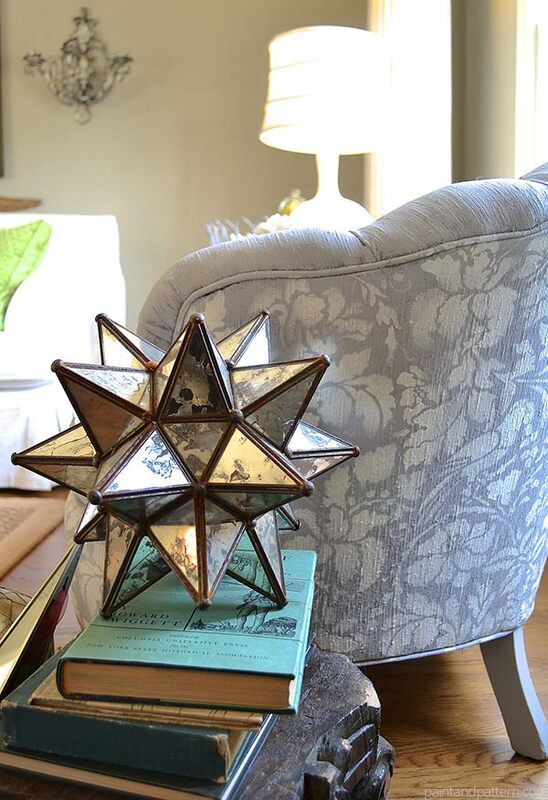 I used Chalk Paint® in Paris Grey for the loveseat and Old White to stencil the pattern. A wonderful overall pattern stencil like mine – the Small French Floral Damask from Royal Design Studio. Miscellaneous: Good quality paper towels like Bounty, clean towels, a small clean container, a pencil, a squirt bottle of water and a measuring tool. When your project is complete, use a product like Motsenbachers Lift-Off 5 to easily clean your stencil. TOP LEFT: This is what I started with – a cute little loveseat I brought home from work that I had already previously painted with two coats of Emile Chalk Paint® but decided I was ready for a color change. TOP RIGHT: Assuming your piece has not been painted, pour some paint into a clean container and add about 20% water to help the paint absorb into the material instead of sitting on top of it. I also used the water bottle to mist more water on the piece as I worked to help it sink in. BOTTOM LEFT: For this project, the Chalk Paint® covered so well, I only did one coat. For yours, count on two at least depending upon the fabric and the color you chose. BOTTOM RIGHT: I removed the large cushion so I could work on the kitchen counter. I measured where I wanted my design to fall, keeping into consideration the front of the loveseat and how the pattern would look there. Since tape was not sticking (it may stick on your piece) I drew some of the design right onto the piece to be sure I did not slip when holding it in place to stencil. TOP LEFT: I used a heavy piece of pottery to help hold the stencil – it is big! TOP RIGHT: I stenciled the entire design, including the funny little partial designs here and there on the outside edges. The best stenciling method is to dip your brush straight down into the paint to pick up just a small amount of paint on the bristles. Immediately swirl the brush on the paper towels until it is almost dry to avoid pushing paint underneath the stencil. Then, swirl the brush in a circular motion on the stencil design. BOTTOM LEFT: These are “registration” marks. They are actually part of the pattern so you can pick up the stencil and move it up and down or sideways and find where the design matches up. 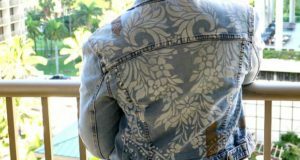 If this is your first time with an allover stencil, no worries, it may take a bit to locate the repeats in the pattern, but you will quickly get the hang of it! BOTTOM RIGHT: Keep stenciling until all of the piece is done. TOP LEFT: I put the cushion on the loveseat, and placed the stencil in position on the pattern beginning in the middle, allowing it to drop down at the front of the sofa. TOP RIGHT: Holding in position with one hand, I stenciled with the other hand until the front was complete. BOTTOM LEFT & RIGHT: Yes, the sloped back was tricky since I was working alone. So, I tipped the whole thing over on top of the coffee table, found the center of the piece and the design, and continue on. 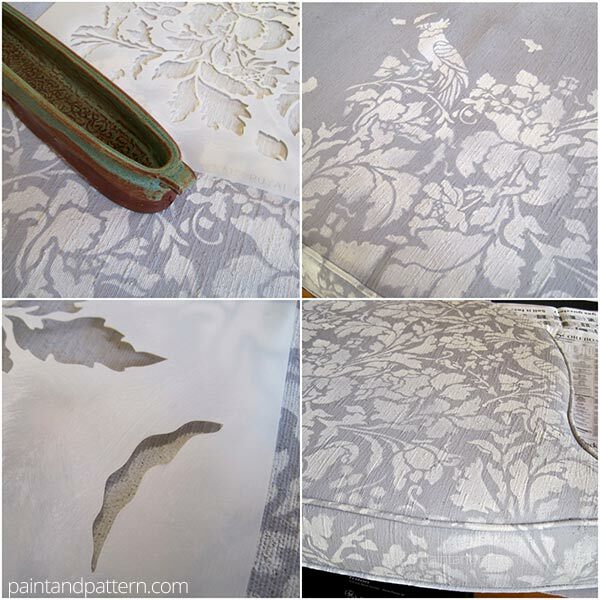 I had planned to stencil the entire piece but when it came time to do the scalloped back, I dropped in the cushion to see how it was coming along and – Ta-Dah! It looked awesome as is with just a fluffy white Mongolian pillow in a corner. 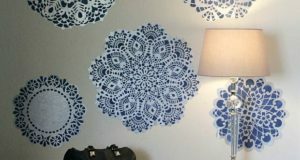 Plus, stenciling into all those nooks and crannies wasn’t something i was looking forward to! So, what was my biggest challenge for this Chalk Paint upholstery project? Other than working by myself, it was keeping my four curious kitties out of the process. Afterwards, they all stopped by to try out their new bed. Depending upon the fabric of your piece, you may choose to add a coat of Annie Sloan Clear Soft Wax. I chose not to do it because I was happy with my results. But wiping on a coat of the wax – particularly on leather or “pleather” and possible chintz might add a desirable patina to the look. With a clean soft cloth, wipe on a small amount of the wax, working in small areas. Pretend you are putting on hand lotion spreading it until it is all gone with no residue on the surface. Turn your cloth often while removing all excess wax. Let the piece sit for 15 minutes or so, then buff to your desired sheen. Painting fabric is a fun way to transform a piece, but it does tend to stiffen the fabric somewhat. Before you begin, you may want to try this process on some scraps first to be sure you get the look you like. If you have completed a similar project, do a happy dance at this point. Congrats! It was a challenge and the results are amazing!! We would love to see photos of your work. This is SO cool! The results are gorgeous, Debbie! Love this!! We have had success using chalk paint on upholstery too. Love the stenciling. Great job! Hi Dana, would love to see pics of your projects! 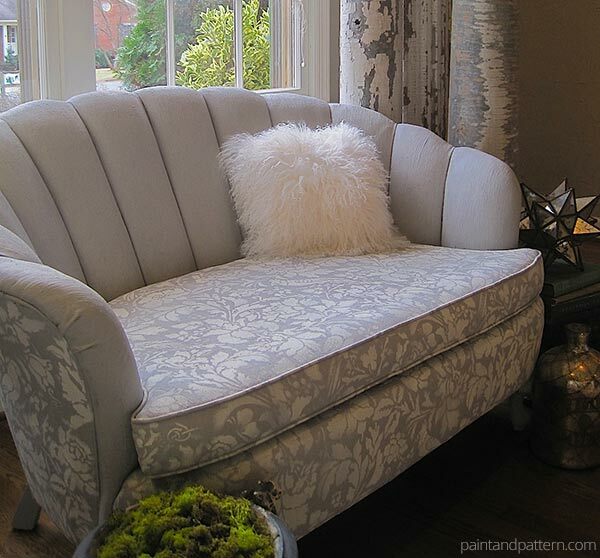 The only thing prettier than a tufted love seat stenciled n floral damask is the same love seat with beautiful Lacey Jane! Debbie, what a gorgeous result! Kitties and stenciling. A perfect combination!!! Anna Edmondson and Melanie Royals you know me so well! I’m reading this while on vacation in Kauai…and cannot wait to get back to stencil an upholstered chair I have in storage. It was previously painted by someone else with fabric paint and I wasn’t sure what to do with it…now you’ve inspired me! It’ll be my first painting project when I get get back…thank you for the great tutorial and inspiration. Now back to RDS to shop for the perfect stencil! Hi Betty, I did go through an Emile phase. Still love it, but now I am in Paris Grey with any color! So glad I saw this to solve my dilemma of needing new cushions that are custom for my rattan dining chairs. The fabric is in good shape, just slightly discolored and no zippers to remove for washing. i think I would do finishing wax so they could be wiped clean. A beautiful solution. Great Elisabeth, and we would love to see your photos when completed. Have fun! I love how this looks!!!! It actually looks like it was manufactured this way. You be proud of yourself girl! Love the impact of the contrast between solid and damask as well as the watercolor effect of the stencil on fabric. Is it possible to spot clean the love seat when the chalk paint is not waxed? If so, how? Same question if the chalk paint is waxed. Hi Suzy, I left this project unwaxed since we only have kitties and adults at home and I love it as is. To clean I would just wipe with a damp cloth and and maybe a drop of dish soap. Worst case, it is so easy to touch up the original Paris Grey and then add the stencil on top, whether waxed or not. The beauty of Chalk Paint® and the ability to paint on top of the Soft Wax! Absolutely gorgeous! Thank you so much for sharing. I can’t wait to do this to a few pieces in my home. Thanks Tammy and be sure to share photos with us! Debbie – what a beautiful project. I always wanted to try this. Does it matter if the fabric is a damask already? 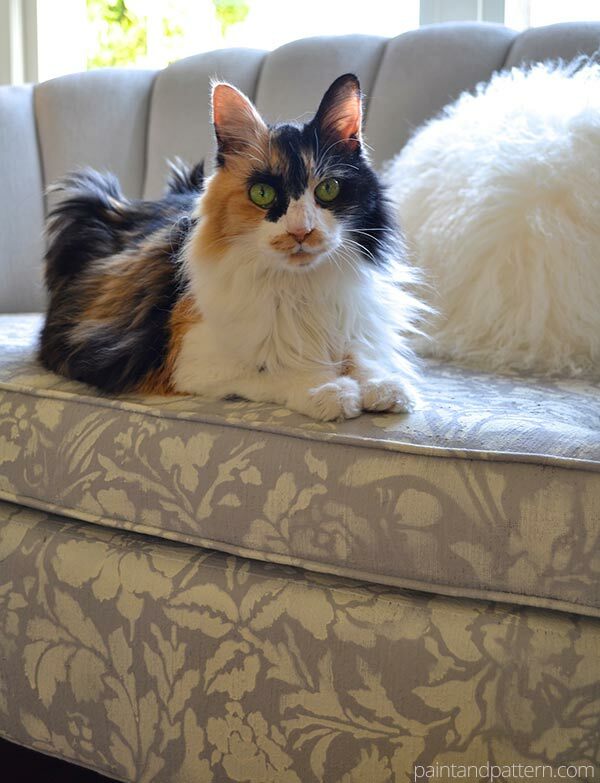 I have a little loveseat that I painted the woodwork already with Old White and I was going to have it reupholstered ($500-600!,) the fabric is a cheap, shiny damask that is hideously ugly…and it has a bit of a texture.do you think this is a candidate? I guess I will just take a stab at it – if it doesn’t look right, there’s always Plan A! Hi Linda! The damask in your fabric should not affect the project unless it is really raised. Can you turn over a cushion and give it a try? Love to hear how it turns out! Hi Debbie…I meant to reply earlier but better Kate than never. I did turn the cushion over and I tried it out first. Came out great! Here’s a post I did about it! Thanks for your advice. Hi Debbie. Thanks so much for taking the time to share your process. I love your results! I’ve been reading up on upholstery painting on & off for the last few months until I can find the time to try it. Still reading & still no time to try it ;-(.. Anyway, I’ve found several different approaches, one of which uses a fabric medium, lots of water from a spray bottle and requires several coats of paint (any latex paint, not just chalk paint) over several days to effectively dye the fabric. Until now I haven’t read anything indicating that the process alters the feel of the fabric in any way. In fact, everything I’ve read seems to go to great lengths to make a point that the feel of the fabric remains the same in all respects. But you mention that your process stiffened the fabric a bit, so I’m wondering why that might be & also wondering if any of your readers have tried any upholstery painting process & whether it altered the feel of the fabric. You mention you had already painted this piece once. Did the fabric stiffen a bit after the original paint coat? If not, do you think it’s possible that the 1st coat of paint might have had something to do with the 2nd coat causing the fabric to stiffen…maybe the 1st coat somehow affected the absorption of the 2nd coat? I would really be grateful for any insight you can provide. Thanks again for sharing your project. This is the first time I’ve EVER read anything that mentions the use of wax and that really intrigues me!! This was the most fun project. I did paint the loveseat before in Emile Chalk Paint® by Annie Sloan for my office. After I moved it to our living room I wanted a new look. The original fabric was pink raw silk, so it was not especially soft to begin with. So, yes I would say even though I used watered-down paint for the very first coat to let the paint soak in to the fabric, it is a bit stiffer now that there are several coats. Because it is used primarily by our kitty menagerie, being ultra soft is not important. But it sure looks great! Some folks choose to use Annie Sloan Clear Wax after painting, but for this item, it truly was not needed. Latex, acrylic and fabric paints do stiffen upholstery and even sometimes crack. Every site I read stated the same…I would be curious to see the sites that say they don’t…Some people say it feels like stiff canvas or leather. I for one, would be willing to try the chalk paint instead…it sounds so much easier and repairable. Painting with any paint is going to change the nature of the fabric. So to me it is a fun thing to do on a piece that I don’t worry about experimenting with. If you mist the fabric before beginning and water down the paint, it tends to sink into the fibers more, but not completely. Try and let me know what you think! Thanks for your comments! Love it! I am wantiing to paint a small love seat. Does the paint crack? I am not really wanting the crackle look. Also, how much paint did you have to use? Did it take more than 1 quart? Thanks! For best results, follow the directions in the post which include watering down the paint. I have never seen the paint crack in a project using this process. My project had already been painted once with Emile Chalk Paint®, but I am guessing you will need one quart without seeing your love seat. Have fun and send us photos! How do you think this technique will work on a short, soft fuzzy, velour type fabric? I missed the answer to painting upholstery with a pile. Have you attempted this? I have an old sofa that I would love to update. Also, does painting a fabric change the texture and feel of the piece once you paint it? 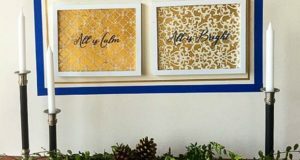 Can you tell me where you purchased your stencil or did you design it yourself?Your results are really gorgeous! Hi Eileen, glad to hear you love this design. It is by Royal Design Studio and listed under supplies in this post. Have fun! I too am concerned about the material becoming stiff afterwards. I am wanting to paint a wing back recliner which has some light stains but is in good shape otherwise. I don’t know if the chair would be comfortable stiff…it’s not a used chair now but I love the style and can’t afford to reupholster it. Any way to make it feel less stiff? Thanks! Hi Rhonda, it is important to add about 10% or more of water to the first coat of Chalk Paint®. You can even lightly mist your piece first with water. Stiffness will be determined somewhat by the fabric you begin with and how thin your coats of paint are. Of course, adding paint will stiffen the fabric some, regardless. I LOVE your information! I am learning so much in a very short period, thank you! I am wanting to paint a medium to dark paisley fabric of a “Flexsteel” brand large chair and matching ottoman with a much much lighter color that would compliment my family room of lighter hard wood floors, tongue-and-grove wainscoting in white accented with our collection of walnut/oak/ash antique furniture with light blue walls and a white tongue-in-groove vaulted ceiling. The chair/ottoman fabric was factory treated (years ago) with Scotchguard. The attached instructions inside the chair/ottoman stated that cleaning with water based cleaners may shrink the fabric so it has been professionally cleaned. This chair/ottoman is over 10 yrs. old and the material which is a medium smooth textured (light tapestry type), cotton/polyester mix; has stretched a bit over the years. Thank you for your time and attention to my above questions. I appreciate your helpful comments very much!! Hi! I have a quick question! I was just wondering if there is a special method for cleaning upholstery painted with chalk paint. I have two kittens (I saw you have cats too), and if something gets spilled or, Lord forbid, there is a litter box issue, do you clean it like normal furniture, or avoid certain products? I am a novice DIY-er, so I’m sorry if this seems like a dumb question! I don’t see any mention of painting a velvet upholstery fabric. Can any fabric with a nap be painted? and do you think it would be stiff? This article is truly an inspiration for me! Thanks so much for sharing this project. I know this is an older thread, but I am in need of some advice concerning a chair I’d like to paint. It is a fabric chair that has decorative upholstery tacks, and I’m not sure how to protect those from getting painted. They’re very close together, and there are a lot of them. I wonder if I should paint over them and then remove the paint? Or keep the paint on them? Or protect them with something that would keep the paint from sticking to them? I’m at a loss at where to start because of these confounded tacks! Any advice would be greatly appreciated! Can you use any chalk paint or does it have to Annie Sloan? How do you clean the chairs after they have been painted? Is it possible to use an upholstery cleaner or steam vac or will it lift the paint? I have two chairs I want to paint with ASCP. The material is microfiber, do you think it will still work following your post?! I’ve worked with ASCP before, but never on fabric and I cannot wait to begin this project. Your chair looks amazing and it is inspiring! Thank you! Yes, that should definitely work, Martha! Let us know how it turns out! It will stiffen the fabric a bit fyi but will look AMAZING! Debbie, Love, love your ideas! Do you think I could add a design to the screen on my screen porch? Is this chalk paint suitable for outdoors? This would really dress up a ho hum outdoor area. Appreciate your feed back. I have a hand carved dining room set: table and chairs that are finished in Florentine crackle. The cushions on the chairs are in pristine condition. I believe the fabric is damask. The color needs to be changed, but I am afraid to try painting it, as the cushioning is very thick and I am afraid the paint would crack over time with lots of use. Have you done dining room chairs used, four times a week? How long have they held up? by your website. If I could be of any help to others, I’d be thankful to help as a result of what I have gained from here. I really wanted to type a quick note in order to appreciate you for these marvelous points you are posting at this site. My extensive internet investigation has finally been honored with good quality facts to exchange with my companions. I ‘d declare that many of us website visitors actually are extremely lucky to live in a fine network with very many outstanding individuals with very beneficial guidelines. I feel rather happy to have seen your entire webpage and look forward to some more cool minutes reading here. Thank you once again for everything. I simply needed to appreciate you once more. I am not sure the things I would’ve followed without the actual techniques documented by you about that concern. It was before a real scary setting for me personally, however , understanding the expert approach you handled the issue made me to cry over happiness. Now i am happy for the support and as well , sincerely hope you recognize what an amazing job you are always doing teaching people with the aid of your blog post. Most probably you haven’t met all of us. I definitely wanted to compose a comment to thank you for the lovely concepts you are giving out here. My time consuming internet lookup has finally been rewarded with reliable knowledge to exchange with my visitors. I would declare that we readers actually are quite fortunate to dwell in a fabulous place with very many lovely individuals with beneficial things. I feel truly blessed to have discovered your entire site and look forward to so many more thrilling moments reading here. Thanks once again for everything. Thank you for all your valuable efforts on this web site. My mum really loves working on investigations and it’s really easy to understand why. I know all relating to the compelling ways you present practical items on your web site and foster contribution from other individuals on that idea then my princess is without a doubt being taught a whole lot. Have fun with the remaining portion of the year. You are performing a superb job. I must show appreciation to you for bailing me out of this type of issue. Right after checking through the search engines and getting things which were not beneficial, I believed my entire life was done. Being alive without the answers to the issues you’ve solved through this write-up is a crucial case, and those which could have in a negative way damaged my entire career if I hadn’t come across your web page. Your natural talent and kindness in playing with all the pieces was crucial. I don’t know what I would’ve done if I had not come upon such a subject like this. I’m able to now look ahead to my future. Thanks for your time very much for this skilled and effective help. I won’t be reluctant to refer your site to any person who would need assistance on this issue. I happen to be commenting to let you know what a fabulous encounter our child found visiting your web site. She came to find lots of pieces, with the inclusion of how it is like to have a wonderful teaching spirit to have the rest completely comprehend some problematic topics. You undoubtedly exceeded my expectations. I appreciate you for supplying these productive, healthy, informative as well as fun tips about your topic to Ethel. I’m writing to make you understand what a superb encounter my friend’s girl had visiting yuor web blog. She noticed lots of pieces, which included how it is like to have a marvelous helping nature to get other people without difficulty learn about chosen tricky matters. You undoubtedly surpassed readers’ expectations. I appreciate you for providing the warm and friendly, trusted, explanatory and in addition easy tips on that topic to Janet. I wish to get across my respect for your kindness in support of those individuals that absolutely need help with this one situation. Your real dedication to getting the message across appeared to be unbelievably insightful and have continuously enabled ladies much like me to reach their aims. Your important recommendations means this much a person like me and substantially more to my office workers. Regards; from everyone of us. I and also my buddies happened to be viewing the best guidelines on your site while immediately got an awful suspicion I had not thanked the site owner for them. The guys appeared to be for this reason warmed to read them and have in effect in actuality been taking pleasure in them. Appreciate your truly being simply kind and also for having this form of essential guides most people are really wanting to learn about. Our honest regret for not saying thanks to earlier. My wife and i ended up being very relieved when Raymond could conclude his inquiry out of the ideas he gained from your own web page. It’s not at all simplistic to just continually be handing out ideas other people might have been making money from. So we recognize we now have the blog owner to be grateful to for this. The entire illustrations you have made, the easy website navigation, the relationships you make it easier to promote – it’s got most excellent, and it is facilitating our son and our family know that the matter is entertaining, and that is pretty important. Thanks for all the pieces! My wife and i have been quite fortunate when Albert could round up his research from the precious recommendations he acquired through your web pages. It’s not at all simplistic to simply choose to be giving for free guides which people today could have been trying to sell. We really do know we’ve got the blog owner to give thanks to for that. These explanations you made, the straightforward site navigation, the relationships you can help to instill – it’s everything excellent, and it’s helping our son in addition to us do think that content is brilliant, which is certainly highly pressing. Thank you for all the pieces! I wanted to draft you this very small note so as to give thanks over again over the gorgeous tips you’ve contributed here. It’s simply pretty open-handed with you to provide freely what exactly many people would have marketed for an electronic book in order to make some profit on their own, mostly now that you might well have done it if you desired. The thoughts also acted to be the great way to be aware that most people have the identical dreams just as my personal own to learn more with regards to this condition. I’m sure there are a lot more pleasurable instances ahead for those who look into your blog. I must get across my gratitude for your kind-heartedness for people that really want help with in this topic. Your personal dedication to getting the solution across has been remarkably effective and have always helped regular people much like me to realize their dreams. Your own valuable publication means this much to me and somewhat more to my mates. Warm regards; from all of us. My wife and i felt now thrilled that Jordan could complete his basic research through your ideas he got through the web site. It’s not at all simplistic just to happen to be giving for free steps which others have been trying to sell. So we fully grasp we have the blog owner to give thanks to for this. The specific illustrations you have made, the straightforward website navigation, the friendships you can give support to instill – it is everything excellent, and it’s making our son in addition to our family reason why the concept is thrilling, which is highly serious. Thanks for all! I wish to point out my admiration for your generosity in support of those who have the need for guidance on in this matter. Your special dedication to getting the solution across ended up being wonderfully interesting and have surely empowered those like me to arrive at their targets. Your amazing insightful key points means this much a person like me and substantially more to my office workers. Thanks a lot; from all of us. Thanks so much for providing individuals with remarkably superb possiblity to read from this blog. It’s always so great and full of amusement for me and my office colleagues to search your site not less than three times in a week to learn the fresh guidance you will have. Not to mention, we’re usually happy considering the good creative concepts you serve. Certain two areas in this post are really the best I’ve ever had. I must express some appreciation to you just for rescuing me from this condition. As a result of looking out through the world-wide-web and obtaining thoughts that were not helpful, I was thinking my entire life was done. Living devoid of the approaches to the issues you have fixed through your main blog post is a crucial case, and ones that might have in a negative way damaged my career if I hadn’t come across your web blog. Your own personal knowledge and kindness in taking care of a lot of stuff was useful. I’m not sure what I would’ve done if I had not come across such a point like this. It’s possible to at this point look ahead to my future. Thank you so much for the impressive and result oriented guide. I will not hesitate to endorse the blog to anybody who should receive care on this subject. Thanks so much for providing individuals with an extremely terrific possiblity to discover important secrets from this site. It is often very excellent and also full of a good time for me and my office co-workers to search your site at a minimum 3 times per week to see the fresh guidance you have. Of course, I’m just at all times pleased with your splendid tips served by you. Some 2 ideas on this page are truly the most impressive I have had. I really wanted to compose a small message to appreciate you for all of the stunning concepts you are posting on this site. My extended internet research has finally been honored with good quality knowledge to talk about with my family members. I would express that most of us visitors are unquestionably endowed to live in a useful website with very many marvellous professionals with very helpful techniques. I feel pretty fortunate to have come across your webpage and look forward to really more exciting minutes reading here. Thanks a lot once again for everything. I simply desired to say thanks again. I’m not certain the things I would have made to happen in the absence of the entire creative ideas revealed by you on this theme. This has been a very frustrating matter in my opinion, nevertheless noticing a specialized fashion you handled the issue made me to cry over delight. Now i am thankful for this assistance and as well , believe you recognize what a great job you were doing training some other people all through your blog. Most probably you have never come across all of us. Thanks for all your valuable labor on this site. Debby enjoys setting aside time for investigations and it is simple to grasp why. Most people know all concerning the powerful tactic you create very important tips through your web site and as well foster contribution from visitors on this concept then our own girl is always learning so much. Have fun with the remaining portion of the new year. You’re conducting a very good job. I wanted to compose a quick remark to appreciate you for all the splendid suggestions you are posting on this website. My time consuming internet lookup has finally been recognized with pleasant facts and techniques to write about with my partners. I ‘d assume that most of us site visitors actually are unquestionably endowed to dwell in a very good place with many brilliant professionals with insightful strategies. I feel pretty lucky to have encountered the web page and look forward to some more awesome times reading here. Thanks again for everything. I want to convey my affection for your kind-heartedness giving support to people that really want guidance on this important situation. Your real commitment to passing the solution around was astonishingly practical and has in most cases empowered professionals just like me to get to their objectives. Your new insightful publication denotes so much to me and extremely more to my office workers. Warm regards; from all of us. I am glad for commenting to let you understand of the fine discovery my wife’s princess went through visiting your webblog. She came to find several issues, including how it is like to possess an ideal helping mood to have the rest with ease know precisely specified extremely tough subject areas. You undoubtedly exceeded people’s desires. Thank you for rendering the powerful, trustworthy, informative as well as fun tips on your topic to Gloria. I simply had to thank you very much once again. I’m not certain the things I might have created without the type of advice discussed by you regarding such area of interest. It seemed to be the horrifying scenario in my position, however , being able to view this specialized way you handled it forced me to jump over joy. Now i am happy for the advice and in addition pray you really know what a great job you happen to be undertaking instructing people today via a blog. I am sure you haven’t encountered all of us. I would like to point out my gratitude for your kind-heartedness for those who actually need help with this important concept. Your personal dedication to getting the solution along had been wonderfully beneficial and have continually encouraged people much like me to attain their targets. Your valuable report means a great deal a person like me and still more to my fellow workers. With thanks; from everyone of us. I simply needed to appreciate you yet again. I’m not certain the things that I would’ve achieved in the absence of the solutions discussed by you on that question. It had been a depressing condition for me personally, nevertheless taking note of the very skilled tactic you treated that forced me to cry with contentment. I will be thankful for this work and thus pray you realize what a great job that you’re carrying out educating the mediocre ones through the use of your web page. More than likely you have never come across any of us. I want to get across my love for your kindness supporting men and women that absolutely need assistance with this particular study. Your special commitment to passing the solution all through appears to be surprisingly significant and has helped men and women just like me to arrive at their pursuits. Your own warm and helpful report means a great deal a person like me and especially to my colleagues. With thanks; from each one of us. I needed to write you a little bit of observation in order to give thanks over again for all the spectacular advice you’ve contributed above. It’s simply tremendously generous of people like you in giving easily what a few individuals would’ve supplied for an ebook to earn some bucks for themselves, precisely seeing that you might have tried it in case you decided. The tips in addition acted to become a easy way to fully grasp that many people have similar eagerness really like my very own to learn more when considering this issue. I think there are several more pleasant moments ahead for many who check out your site. Thank you a lot for giving everyone such a remarkable opportunity to check tips from this blog. It is usually so enjoyable and jam-packed with amusement for me personally and my office friends to search your web site minimum thrice a week to see the latest issues you will have. Of course, I am just always astounded for the amazing knowledge you give. Some 3 facts in this posting are rather the most efficient we’ve had. I precisely had to thank you so much yet again. I’m not certain what I might have tried without these solutions shared by you concerning such area of interest. It has been an absolute hard problem for me personally, but seeing this specialised mode you processed the issue took me to leap over delight. I am just thankful for your advice and then hope you realize what a great job that you’re undertaking teaching others using your site. Most probably you haven’t encountered any of us. My spouse and i ended up being now fortunate Emmanuel could finish up his reports because of the precious recommendations he received through the blog. It’s not at all simplistic to just be handing out key points many others have been selling. And we all figure out we now have the writer to thank for that. All the illustrations you’ve made, the easy site navigation, the friendships your site make it easier to promote – it is many astonishing, and it’s aiding our son and our family know that the situation is pleasurable, which is wonderfully mandatory. Thanks for the whole lot! I together with my pals have been studying the excellent tricks found on your web site and so all of a sudden I got an awful feeling I had not thanked the website owner for those tips. These women became very interested to read all of them and have now truly been having fun with those things. I appreciate you for simply being considerably thoughtful and for having these kinds of ideal information millions of individuals are really wanting to be aware of. My personal honest apologies for not expressing gratitude to sooner. My wife and i got contented that Raymond managed to round up his basic research while using the precious recommendations he was given from your very own blog. It is now and again perplexing to just find yourself making a gift of ideas which often other folks may have been making money from. We figure out we need the writer to thank because of that. These explanations you’ve made, the simple website menu, the relationships you make it possible to engender – it is most incredible, and it’s facilitating our son in addition to the family feel that that theme is interesting, which is certainly especially pressing. Thank you for everything! I really wanted to post a small comment to thank you for all of the unique ideas you are showing on this website. My long internet search has at the end been paid with pleasant strategies to share with my partners. I would tell you that we website visitors are quite blessed to dwell in a great site with many awesome professionals with good suggestions. I feel pretty grateful to have used the site and look forward to many more entertaining moments reading here. Thank you once more for a lot of things. I happen to be writing to let you understand what a fabulous encounter my daughter went through using your blog. She discovered a good number of pieces, most notably what it is like to have a great teaching spirit to let certain people very easily fully grasp chosen grueling things. You undoubtedly surpassed visitors’ expected results. Thank you for displaying those priceless, dependable, edifying and even unique tips on your topic to Lizeth. I in addition to my buddies happened to be examining the great helpful hints from your website while unexpectedly got a horrible feeling I never thanked the site owner for those secrets. All the women are actually as a consequence excited to read through all of them and already have quite simply been using those things. We appreciate you truly being really kind as well as for pick out this form of important areas millions of individuals are really desirous to be aware of. My very own sincere regret for not expressing appreciation to sooner. I intended to draft you this tiny remark so as to give thanks over again just for the gorgeous ideas you have featured at this time. It’s certainly shockingly open-handed with you to supply easily all some people would’ve marketed for an e-book to end up making some cash for themselves, primarily now that you might have tried it in case you desired. The tips in addition served to become a easy way to fully grasp the rest have the identical desire like mine to see great deal more in respect of this problem. I am certain there are numerous more enjoyable periods up front for individuals who discover your blog. Thanks a lot for giving everyone such a remarkable opportunity to read articles and blog posts from this web site. It is often very great and as well , stuffed with a great time for me and my office fellow workers to visit your site the equivalent of three times a week to learn the newest guides you have. And indeed, I’m also certainly satisfied concerning the extraordinary hints you give. Selected 1 tips in this article are clearly the very best I have had. I must express my affection for your kindness in support of men and women that actually need assistance with this important issue. Your very own commitment to getting the message around turned out to be especially invaluable and have truly encouraged men and women much like me to reach their pursuits. Your amazing invaluable guidelines entails a lot to me and somewhat more to my office colleagues. Thank you; from all of us. I needed to write you this bit of observation to thank you over again relating to the fantastic ideas you have contributed on this website. It was pretty open-handed of people like you to provide openly all most people would have offered for an electronic book in making some bucks for their own end, precisely considering the fact that you might well have tried it if you wanted. Those basics likewise worked to be a easy way to be certain that other people have the identical zeal just as my personal own to know the truth much more concerning this issue. I believe there are thousands of more pleasurable opportunities up front for people who discover your site. I as well as my guys have been viewing the good techniques found on your web page while before long I got a horrible suspicion I never thanked the website owner for those secrets. Those ladies happened to be consequently glad to read through them and already have clearly been enjoying them. We appreciate you simply being really kind and also for opting for variety of quality resources most people are really needing to learn about. Our honest regret for not expressing gratitude to you earlier. I as well as my friends were actually reading the good thoughts located on your web page then before long got a terrible feeling I had not thanked the blog owner for those strategies. Most of the women were consequently excited to read all of them and already have undoubtedly been loving these things. Appreciation for indeed being indeed helpful as well as for picking this sort of wonderful areas most people are really needing to learn about. My honest apologies for not saying thanks to sooner. I wish to get across my love for your generosity supporting all those that absolutely need assistance with the subject. Your special dedication to passing the solution along turned out to be exceedingly helpful and has continually helped people just like me to reach their objectives. Your amazing interesting useful information denotes much a person like me and a whole lot more to my mates. Thank you; from all of us. Wonderful comfort and ease and fashionth, and that i like frontal lace wigs https://youtu.be/3KO3e4I3_24! I must express my thanks to this writer for bailing me out of this instance. As a result of scouting throughout the the net and seeing proposals which were not pleasant, I assumed my life was over. Being alive devoid of the solutions to the problems you’ve resolved through your entire site is a crucial case, as well as the ones which could have badly damaged my entire career if I hadn’t discovered your blog post. Your actual know-how and kindness in dealing with all the details was tremendous. I’m not sure what I would’ve done if I had not come upon such a stuff like this. I can at this time look forward to my future. Thanks for your time very much for your skilled and sensible help. I will not hesitate to endorse your web blog to anybody who needs and wants direction about this matter. My spouse and i ended up being now thankful that Emmanuel managed to finish up his basic research through your precious recommendations he received in your blog. It is now and again perplexing to simply always be freely giving helpful tips which usually some people may have been selling. And now we understand we have got the blog owner to appreciate for that. The type of explanations you’ve made, the easy website navigation, the relationships you can assist to create – it’s got many fabulous, and it’s really leading our son and our family reckon that that concept is fun, which is certainly pretty pressing. Many thanks for all! I actually wanted to jot down a simple note to express gratitude to you for those splendid recommendations you are giving out on this site. My time-consuming internet lookup has finally been compensated with professional strategies to share with my two friends. I ‘d claim that we visitors actually are quite endowed to be in a great community with so many brilliant professionals with very beneficial strategies. I feel quite grateful to have encountered the website page and look forward to some more brilliant moments reading here. Thank you once again for all the details. I precisely wanted to appreciate you yet again. I’m not certain the things that I could possibly have tried in the absence of those aspects shown by you directly on that topic. It was before a very terrifying difficulty in my view, nevertheless taking note of the very professional mode you processed it took me to cry with fulfillment. Now i am happier for your support and in addition expect you find out what a great job you are always putting in instructing most people via your blog. Most likely you’ve never encountered all of us. Thanks so much for giving everyone an exceptionally marvellous possiblity to read articles and blog posts from here. It can be so beneficial and full of a lot of fun for me and my office colleagues to search your site at the least 3 times a week to study the latest issues you have got. Not to mention, we are certainly fascinated concerning the mind-blowing solutions served by you. Selected two areas in this post are ultimately the most beneficial we have ever had. I wanted to write down a brief remark in order to say thanks to you for some of the splendid ideas you are posting at this site. My rather long internet look up has finally been honored with good ideas to go over with my companions. I would tell you that we visitors actually are unequivocally lucky to exist in a magnificent community with very many wonderful individuals with beneficial basics. I feel very much privileged to have come across your site and look forward to many more cool moments reading here. Thanks once more for a lot of things. I actually wanted to write a small note to be able to express gratitude to you for the fabulous guides you are posting on this website. My incredibly long internet lookup has at the end been paid with reliable ideas to write about with my family and friends. I would admit that we readers actually are undeniably endowed to be in a fine network with very many marvellous professionals with useful strategies. I feel very much privileged to have come across your site and look forward to really more amazing times reading here. Thank you again for a lot of things. Thanks for all your hard work on this site. Kim takes pleasure in making time for investigations and it’s really easy to see why. Most people notice all relating to the dynamic means you give practical solutions by means of your web site and as well recommend response from other people on this situation then our favorite girl is now studying a whole lot. Take pleasure in the remaining portion of the year. You are always carrying out a very good job. I precisely desired to appreciate you all over again. I’m not certain the things I would’ve achieved in the absence of the actual tactics shown by you about such a concern. It was the depressing difficulty in my view, nevertheless spending time with your specialized mode you processed that made me to jump over fulfillment. I’m grateful for the information and believe you know what a powerful job you were accomplishing educating people today with the aid of your webpage. I am sure you haven’t encountered any of us. I simply had to say thanks yet again. I do not know the things that I could possibly have worked on in the absence of the type of techniques shown by you on such situation. Entirely was an absolute frightening issue for me personally, but being able to view a new well-written form you resolved it made me to jump for joy. I’m just happier for the help as well as wish you know what a powerful job you happen to be providing training the rest using your web blog. I’m certain you haven’t come across all of us. I precisely needed to appreciate you once again. I do not know the things I would have gone through in the absence of these information discussed by you regarding that area of interest. It truly was an absolute fearsome problem for me, nevertheless being able to see a new specialized way you resolved the issue forced me to jump for gladness. Extremely grateful for the service and in addition wish you find out what a great job your are putting in instructing most people all through your web site. I’m certain you haven’t encountered all of us. I wish to point out my love for your kind-heartedness for persons that have the need for help with this issue. Your special dedication to getting the message all around became remarkably invaluable and has made somebody like me to achieve their dreams. The invaluable facts signifies this much to me and especially to my fellow workers. Many thanks; from everyone of us. I really wanted to send a small message to thank you for the great pointers you are posting at this website. My time intensive internet search has finally been recognized with reasonable suggestions to share with my visitors. I ‘d say that many of us visitors are unquestionably endowed to live in a magnificent place with very many outstanding professionals with very beneficial strategies. I feel truly fortunate to have encountered the site and look forward to plenty of more cool minutes reading here. Thanks a lot again for all the details. I’m commenting to make you be aware of what a fine encounter our girl enjoyed visiting your web site. She came to find so many things, which include what it’s like to possess an awesome coaching style to get the others smoothly learn chosen complex issues. You actually did more than our desires. Many thanks for delivering such good, safe, edifying and also unique tips about this topic to Jane. I am only writing to let you understand of the really good experience our child obtained browsing your blog. She discovered numerous details, which include how it is like to possess a marvelous giving mood to make other people without hassle completely grasp certain complicated subject matter. You actually exceeded readers’ desires. Thanks for rendering such insightful, healthy, edifying and as well as cool tips about that topic to Janet. My wife and i have been so thankful Edward managed to carry out his studies through your precious recommendations he was given from your own web page. It’s not at all simplistic to simply always be giving out information and facts which some other people could have been trying to sell. We really do understand we need the blog owner to be grateful to for this. These explanations you made, the easy site navigation, the friendships you will help foster – it is all great, and it’s really facilitating our son in addition to our family reason why the subject is brilliant, which is certainly highly indispensable. Thank you for all the pieces! I wish to convey my appreciation for your kindness for folks that really want assistance with in this subject matter. Your special dedication to getting the message across turned out to be amazingly advantageous and has surely encouraged guys and women like me to get to their aims. Your new warm and friendly key points denotes a lot a person like me and substantially more to my colleagues. Thanks a ton; from everyone of us. I precisely needed to thank you so much once more. I do not know the things I would have implemented without the type of concepts documented by you relating to this field. Certainly was the intimidating matter in my view, however , spending time with the professional avenue you handled that made me to leap with gladness. Now i am thankful for this service and even trust you realize what an amazing job you happen to be undertaking educating other individuals via a web site. I am sure you haven’t come across all of us. Thank you a lot for providing individuals with an exceptionally remarkable possiblity to read from here. It is always very awesome and also full of a great time for me personally and my office fellow workers to search your blog particularly 3 times a week to read the newest issues you will have. Not to mention, I’m so certainly astounded with the remarkable opinions you serve. Certain 1 tips on this page are in truth the most efficient we have all had. I would like to express my affection for your kind-heartedness for people who must have guidance on your theme. Your personal dedication to getting the solution across appeared to be extraordinarily good and have specifically enabled many people much like me to arrive at their endeavors. Your own helpful guidelines can mean a lot a person like me and extremely more to my peers. Best wishes; from everyone of us. Pingback: Stencil DIY: Leather Club Chair Goes Drab to Fab!